Welcome to the online home of the North American Astrophysical Observatory! June 6, 2017: Click here for a rebuttal of the claim that the "WOW!" signal was caused by a comet. 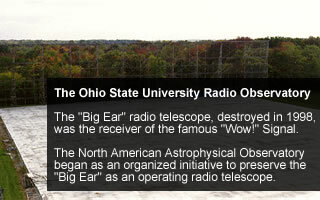 NAAPO was chartered in 1983 as a non-profit organization to save and continue operation of the Ohio State University "Big Ear" Radio Observatory. Since then, NAAPO has continued to advance the field of radio astronomy through Argus, a revolutionary, omni-directional radio telescope. Here are some other areas to explore and learn more about NAAPO! Copyright © North American Astrophysical Observatory. All rights reserved.